Not just craftmanship, but art. With over 100 years of combined experience in cabinetry, Jamie Williams Design create stunning bespoke kitchens and fitted wardrobes that are truly unique. Jamie Williams Design of Cheltenham, create and install perfectly crafted kitchens and fitted furniture. Every project is built by a team of expert cabinetmakers with over 100 years combined experience. Each member of the team are trained with an eye for unsurpassed quality. You can expect the precision, attention to detail and finish that sets us apart. We only source the finest materials from luxurious hardwoods to subtle metals and stone. This ensures that your bespoke kitchen and fitted furniture both looks and feels exceptional. There is no 'one size fits all' at Jamie Williams Design, each clients project is unique from the start of the design process to the fitting of the final handle. With our passion for being the best at what we do, we push the boundaries of cabinet making using modern technologies dovetailed with traditional time served methods. Our design process never changes, but that's because we've perfected it. Our kitchens and furniture don't follow a 'one size fits all' approach. We carefully design and tailor everything we make to your specification without compromise. To start this we need to listen to you. We will arrange a consultation, which can be at our workshop office in Cheltenham, but primarily at your home first so we can get the best idea of the space we're working with. We'll hear all your wants and desires at this meeting, taking careful notes on the aesthetic feel and practical requirements that you have. Our discussion with you helps us to translate your ideas into a beautiful handmade kitchen or piece of furniture. Once we've booked your project in, we'll get to work on producing your Photorealistic (CAD) visuals which we render in-house. These will help you to clearly envision how your completed project will fit in your home before we've built it. We use top of the range software to get the best results. This stage of the process is as bespoke as our craftsmanship. We're lead by your preferences on every level. Communication is our strength and it is key in each aspect of our business, We work in a collaborative way with you to ensure a perfect result every time. We won't make assumptions or leave things to chance - we communicate with and involve you in making your project a success. Always a perfectionist, Jamie Williams started his career serving a full apprenticeship, and working for a joinery company in 1995. Driven by his attention to detail and a passion for craftsmanship, he quickly progressed always striving to be the best he could be. 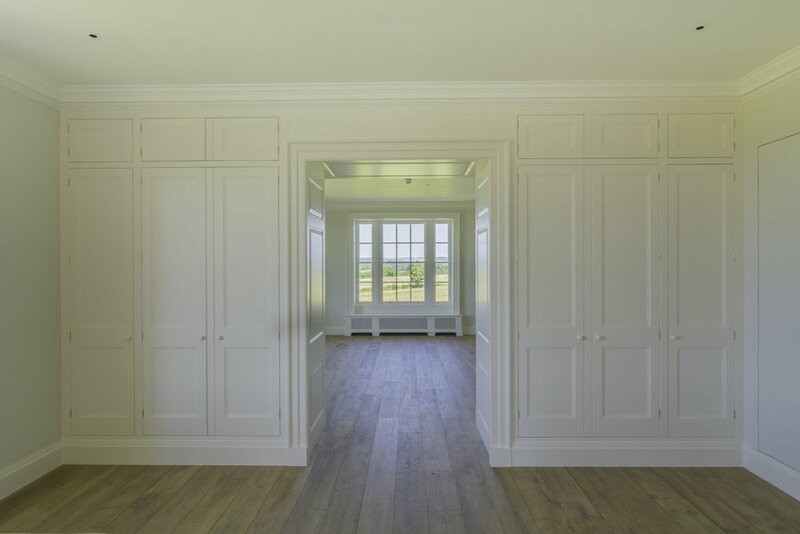 With continued enthusiasm and passion he soon realised that there was a need for beautiful, truly bespoke fitted furniture made without compromise. With mediocre furniture and poor customer service crowding the market, Jamie Williams Carpentry was born determined to be the opposite of this. With a mission statement to: 'Create without compromise' the business has grown well over many years to where it is now - Introducing Jamie Williams Design, who not only build exceptional pieces of furniture but specialise in the whole design experience of your bespoke kitchen or furniture from the initial consultation to the final fitting. Seeing wood from its raw sawn state, to being machined, shaped, sanded and finished as a unique piece of beautiful and practical furniture - presented to a client, is a process that Jamie is truly in love with, and it continually inspires and drives him! Type some words to send us. This little set of boxes below means you can send us a message and we'll reply as soon as we can. This is usually the same day, so it would be a good idea if you sat by your computer and refreshed your inbox over and over in anticipation. Things we've been working on. Wow! This garden room is not one to miss! Our new oak and ash supplier Venables Oak! We're happy to announce our new timber supplier Venables Oak!